Last night’s dreamtime was not dreaming but actual being in Telos and talking with the Masters. I kept waking up but knew I was also there with them. I was having dreams of architects and buildings which I know has to do with the Golden Cites. I believe the planning stages are being conducted in the subterranean cities of which Telos is one of them. More elements happened which made me realize the reality of this week that I have experienced while being in Mt. Shasta. Today was very magical and some would say, “How could this be happening or is this really true?” What I am about to share with you may seem unreal but being in Mt. Shasta magical events occur especially when you are being acknowledged for the work that you have done. I arose early and was out of the guesthouse by 7:30 stopping by my favorite coffee house which originally was my favorite and then we went to another one. Now that has changed hands and the energies are different. This place is where all the townspeople meet and is very friendly. 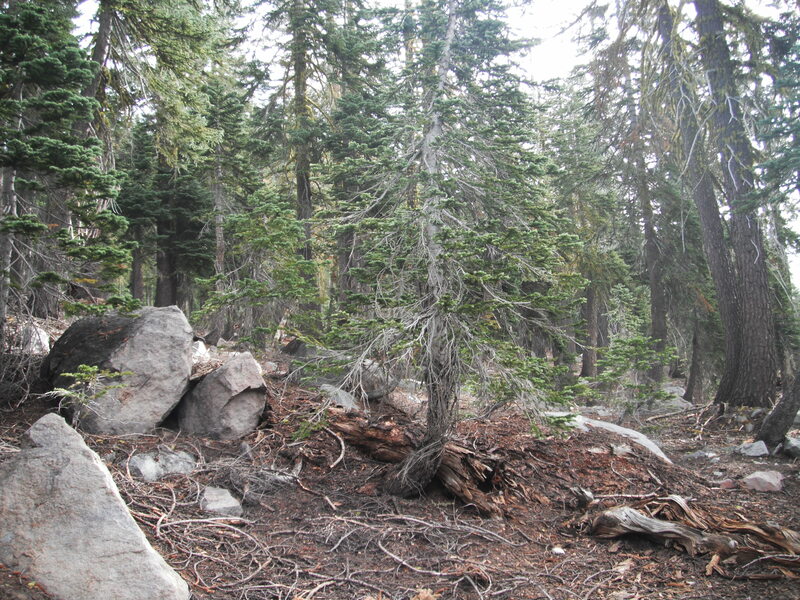 Then I was on my way up the mountain preparing to go to Lower Panther Meadows. 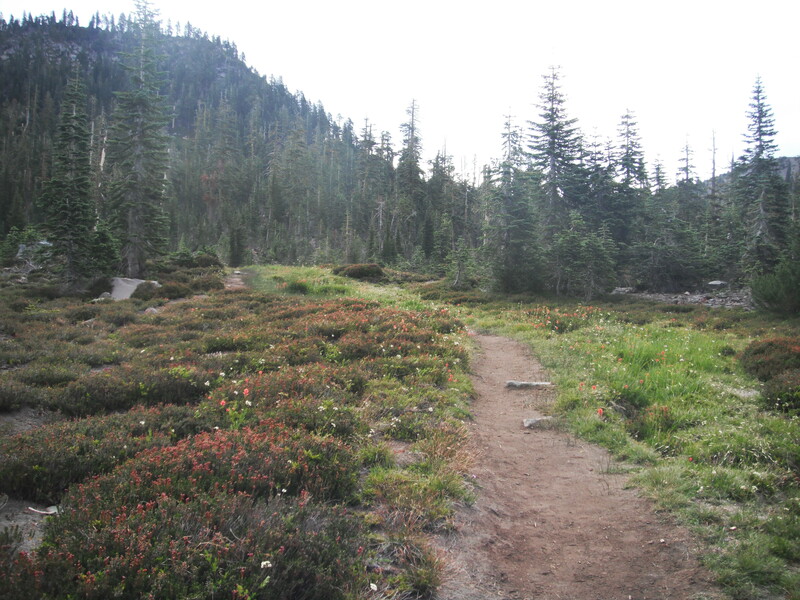 I knew which direction I wanted to hike towards and started through the meadow. The weather was threatening but the sun kept trying to show himself. I thought I would walk to this medicine wheel that has been there for along time but then felt St. Germain telling me it was not the right place. I was in fear this morning. Not sure why and then my coffee decided to act up on my stomach. That took me off track to find a bathroom which I did as I was near a camping area. I then was unsure what to do until I started seeing the “Little People” who are mountain people in Mt. 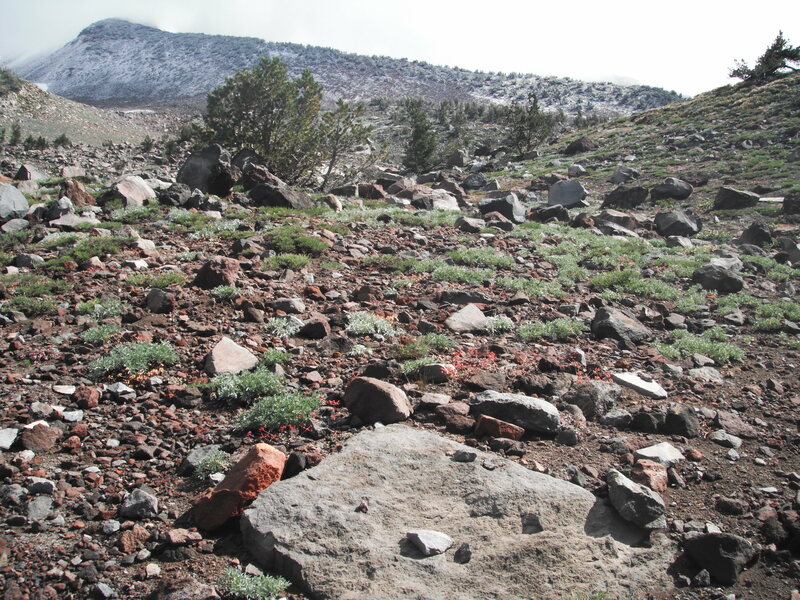 Shasta dancing around me and taking me back upon the first pathway. 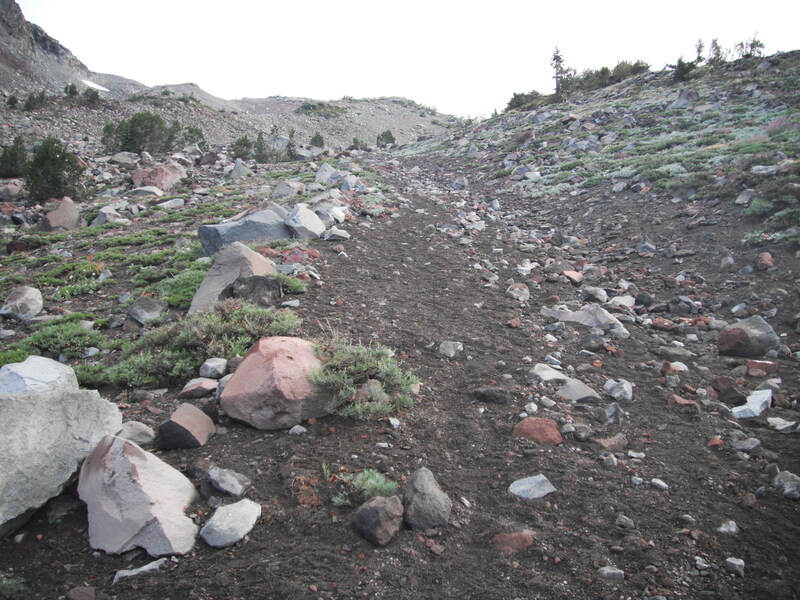 I started walking past the meadow and followed the path which goes up the side of the mountain. Some of the areas are strewn with mixed energies and was very unsure of myself. Off the Path and Through the Woods! I was directed off the path going into the woods a little bit and this concerns me as a person who grew up in the woods knows that you have to be careful where you walk. I saw an opening over an embankment and thought that was the space. I was still getting prompting to go further into the woods when all of a sudden I saw some snake holes. “Warning Sign” was in my mind and I heard, “Snake country, move back.” I do not have to be told twice as this has always been a fear of mine but I learned to protect myself and not hold onto the fear. I went back to the first opening I saw and pulled out my violet scarf so I could lay down some crystals I had bought to charge them with the Telosian energies. I sat down on my backpack and started reciting the 22 Rays of Gold along with bringing in the Native energies. After I did this, I knew that I needed to move again. I believe the area was infested with negative ET energies which I have encountered previously in body and in spirit in Mt. Shasta. I no longer have fear as I learned to raise my vibration. I did hear them talking with each other and asking who I was. One of them said, “Stay away from her; she is with them.” With that they left me alone and I found my way back onto the pathway. 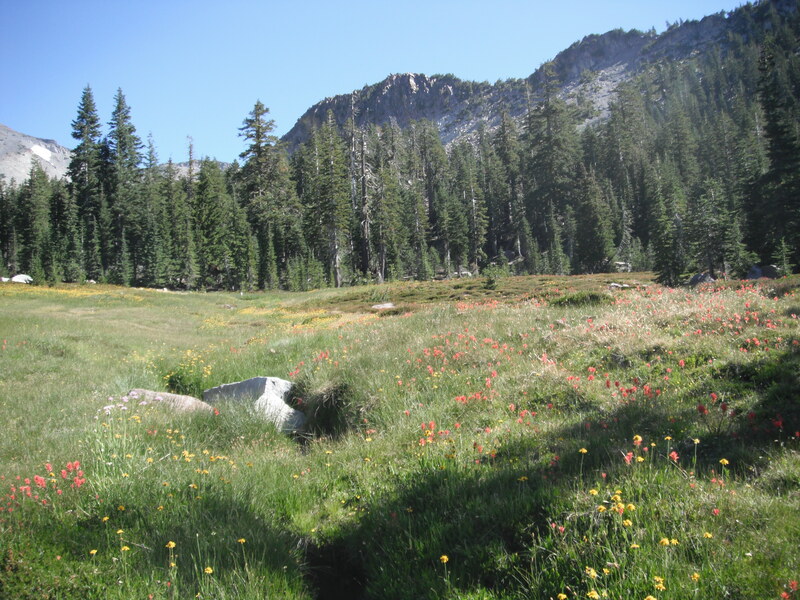 I then traveled back through Panther Meadows, through the campground and towards another part of the meadow, which is the end of the meadow. I had been there last year and it is very serene. 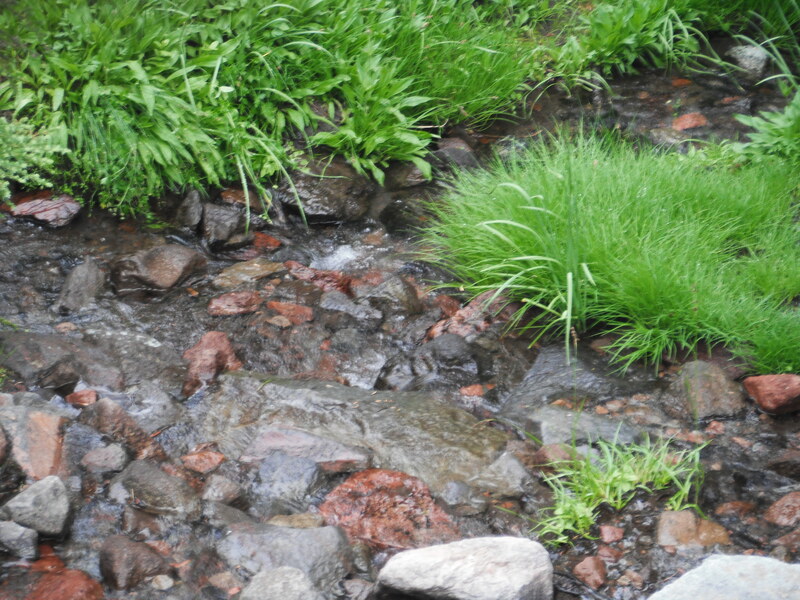 I had intended to stay there but then saw a small sign that had an arrow pointing to a stream. I decided to take that pathway. Before I did so, I made a little video of the stream which I will share at a later time. 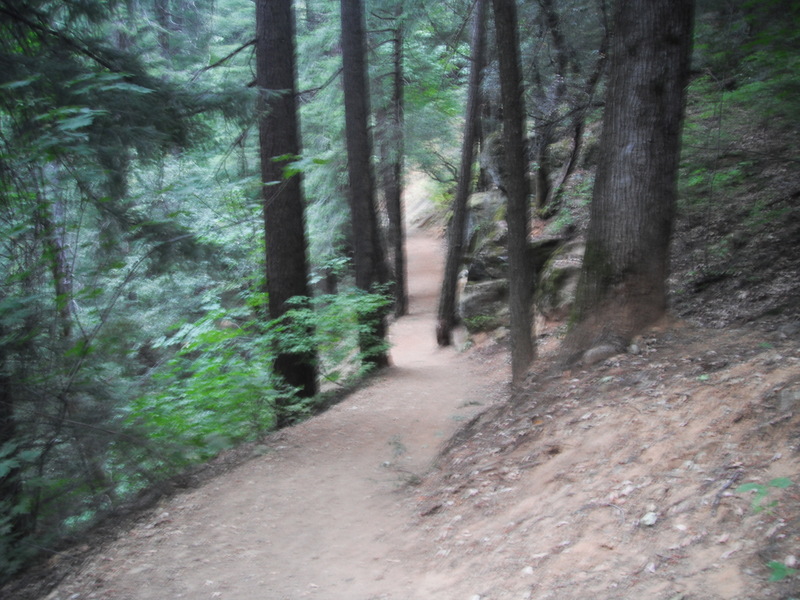 The path went through the woods and was pretty steep. These energies were magical, very fairy-like, and strewn with Merlin energy. I felt very peaceful as I was walking. I could hear the stream but could not see it. I traveled about 20 minutes when I saw a long log in the ground making a step down. It was pretty steep and with my knee issues knew I would have a problem. I then just sat down and pulled my legs over the edge. The stream was on my left through the grassy meadow and was very serene. I felt this was the perfect spot for me to connect. I again pulled out all the crystals and sat there in meditative silence just listening to the water running down the mountain. It was very peaceful. I then saw Adama in front of me, in 5th dimensional frequency. He told me that I have been traveling to Telos all week as I have the ability to be in two or more places at the same time. He said my 5th dimensional body has been going to Telos and my 4th dimensional body as been on the mountain. He explained to me that no human is allowed into the Telosian City in a 3rd or 4th dimensional body. He also told me that when he and other Telosians travel to the upper Earth they need to bring their frequency down a bit in order to handle the lower energies. Otherwise, they can become very sick. This is exactly what happened to me yesterday after being on the Portal of Light and walking into town. He explained to me that in order to teleport the physical body it must be in the higher frequency consistently which is challenging with the energies that we incorporate in our world. He did show me the consciousness when I teleported my 5th dimensional consciousness into Telos but was still in consciousness in my physical being. I experienced the two worlds at the same time and realized the dreams I had last evening were truly the actualization of being in Telos. I saw the same people that were in my dream. He also told me that three years ago when a small part of me stayed in Telos, I was unable to handle both worlds at the same time. That is no longer true. He explained to me that I would be doing this more often and I have been doing this in the past year. This explains to me while I have periods of time in which I would be either needing to sleep or in a stupor. Now I know how to handle it more fully. I also learned that the construction of the Golden Cities is underway in Telos and that I am very much involved in the organization of these cities. I am unsure what that means to me in my present lifestyle, but I do know eventually I will be living in both worlds for awhile. Doorways are being opened for me to move into a different location wherein my fifth dimensional energies will be supported. My present environment does not support that type of energy. Today was confirmation for me of what I have been going through for the past several months. My world has always been in Spirit and this trip has helped me to realize why it has been this way. When I first started working with the Masters, I felt so much at home with them. On this day I felt like I had returned and had been away for a very long time. 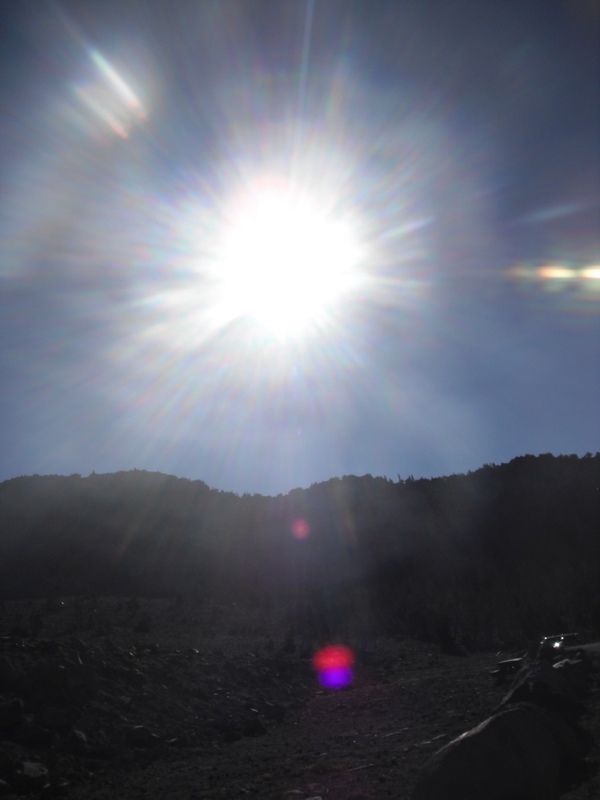 Saint Germain came by with his energies as Adama was speaking with me and both of them walked with me back up the mountain path as did all of the seven Ray Chohans. I am in awe that I can walk with these beings and feel at One in their space. They have always been my mentors but now the relationship has changed; I know my responsibility is going to be much greater than ever before. I walked back to my car and I retired my walking stick. I left it in the brush for someone else to use. It would be my last time on the mountain for this trip. I came back into town and started preparing for my trip back home. I went into an internet café to print out my boarding pass for tomorrow and decided to ship some of my clothes home as my suitcase was too close to the pound limit. I was so very tired and slept, took a shower, and prepared for my evening. Quan Yin came to me and asked me to go to the Tree Top Restaurant for dinner. I had not planned on really doing an official meal out but thought, well, if they are asking, I will do so. The Tree Top has a special remembrance has there has been great magic that has occurred for myself and others in one of our other trips. That is for another day to explain what happened that time and will be in my upcoming book on my journeys to Mt. Shasta. Adama kept telling me that it was going to be wonderful. One needs to understand that being with the masters in Mt. Shasta creates other worlds to come together. Everyone becomes psychic in Shasta so a request of this kind is not out of the ordinary. I walked into the dining room and actually saw Adama waving at me. At the table was Adama to my left, Quan Yin across from me and then Saint Germain next to her. Of course, I paid…It is a little joke that my friend, Judy and I have about how the masters always want us to buy gifts for ourselves and the money comes from within. They just keep telling me more is coming. So I sat there and had a wonderful meal as I conversed with these three great masters. I looked around the room and I saw some familiar faces in Spirit. Many of them were there including Fred from the Clarion Light Beings. The waitress was very special and I saw it in her eyes. Her demeanor was very positive, very polished and nothing like the Upper Earth. I connected deeply within her eyes and knew that she was probably a Telosian. Adama, Quan Yin, and Saint Germain have asked me to partner with them on putting together a course or class in raising the 5th dimensional energies. I have not received the full information on how this class is going to enfold but I do feel very sure about this. This meeting would not have happened if it had not already been put in place. The main part of this information is that you don’t question it and if you do, it is coming from your lower mind. Being in the moment and accepting it are all one needs to do. After dinner, I drove up to Castle Lake but it was late and getting dark. 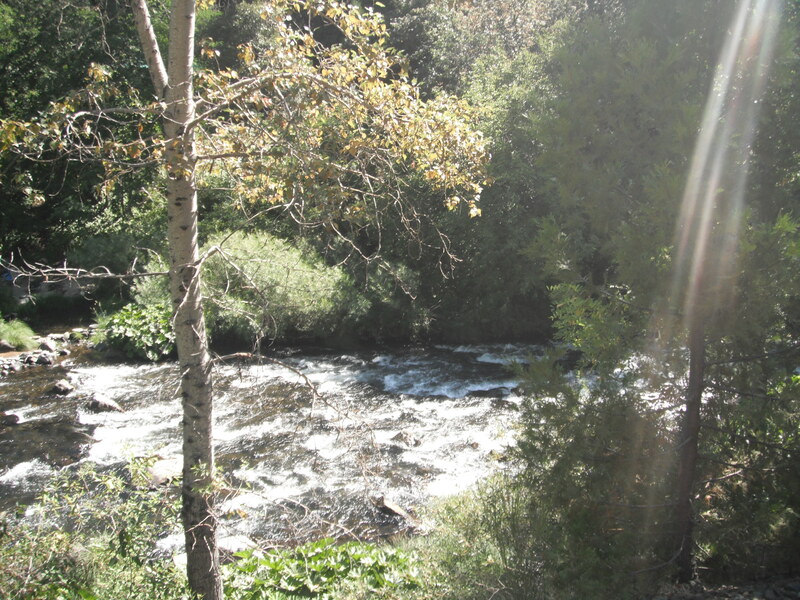 The energies were not conducive for me to even get near the lake. I was very uncomfortable. I did see two deer look at me going up the mountain and then again, coming back. 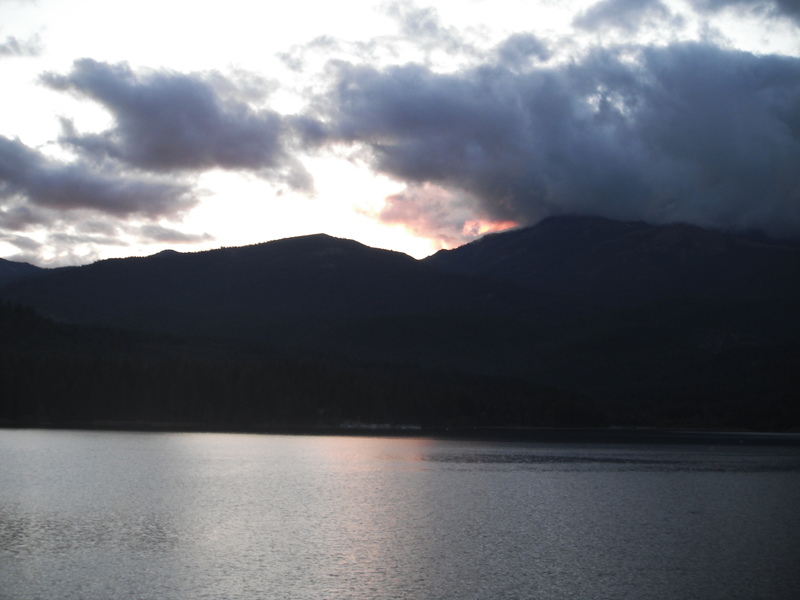 I stopped at the dam of Lake Siskiyou to take some pictures with the sun in the clouds. The weather is opening up and is very representative of my leaving the area. I believe that all was in Divine Order with each moment precisely planned by my I Am Presence and the Masters. We came together in love; they asked me to be in Mt. Shasta at this time and I knew it had to do with my inner journey. I also was sure that my life would change and well, it has. I am leaving here early in the morning with a full day of travel. First, driving 3.5 hours to Sacramento and then on two different planes to arrive in Philadelphia at 11:30 pm. I am leaving Shasta this time with a different feeling. Many times I am crying that I do not want to leave and that a part of me wil lalways be here. The magic is unbelievable for me in this beautiful arena. This time, the magic is me. I no longer have to look for it as I have fully acquired it as I own it within me. My friend, Judy and I are traveling to the Grand Tetons in three weeks. This was a planned trip for some months guided by the Ascended Masters once again. I believe this trip in Mt. Shasta was necessary for our journey in the Tetons. There is also great magic there and we will be continuing the connection on a physical level with our own mastership along with creating more magic. I am honored to be able to share my story with you at this time. PS I will be using Meleriessee in all of my spiritual communications. I love my name Christine as my parents named me because I was born around the Christmas holidays but Meleriessee is my star name and I need to fully own it. This morning I awoke not wanting to get out of bed. Okay, this is a big red flag for me. I always know that something is coming up that I need to walk through and my physical being is resisting. I fell back asleep until 7:30 and took my time this morning but feeling guilty. Why, the guilt? It is my time, right. Oh, and the Ascended Masters that are working with me. It worked out great because there were two people staying in another room in the guesthouse who were leaving today, and we had not had much time to converse. It turns out Collin, previously lived in Doylestown, PA which is in my general area, not close but I knew where it was located. It was great to connect with them before I went on my way up the mountain. I arrived at the highest point where you can park and the clock said 9:11. Very appropriate for me since I do the Clarion Light Beings of 911 & Beyond and felt it was a great sign. The temperature outside was 39 degrees and I had to hike up the mountain. I am thinking, ‘yikes, it is freezing’. I had on about six layers of shirts with a sweater, sweatshirt and cotton gloves. So off I went. The peaks of Mt. Shasta split so there are lower peaks and then higher peaks just like any other mountain. I have always wanted to travel to this one peak on the other side as I knew there was a portal there. I have never been able to do so physically, and knew that today it was time. I believe that was part of my hesitation this morning. It is not an easy climb but I took my time. There is a pathway but as I got higher it was strewn with many rocks, and I had to be careful where I stepped. Again, I can throw myself off-balance very easily, but I was feeling very different. I could feel the Masters encouraging me onward and telling me it was not to much further. At one point, I heard, “Hey Sweetie, it’s right around that bend. Not too much farther.” I knew it was my father’s voice, and it warmed my heart that my loved ones were with me in this climb. When my parent’s passed away, they ascended very quickly as they always listened to my teachings even when they did not understand them. Both my mother and father quickly went up the ladder of acceleration, and they are both doing tremendous work for others. I rounded the bend that my father had spoken about and I was in awe. In front of me was a circle of different shaped rocks that reminded me of Stonehenge in England, although I have never been there. The energies emanating from the circle of rocks was amazing. I just had to figure out how to get myself in the middle of them without disturbing the plants and wildlife. Many trudge over these areas without even thinking so I am very respectful of every place I walk. I found a place in the middle and was very careful of where I was to sit. I banged on a couple of rocks making sure there were not any creatures I did not want to encounter to appear. It seems that the area had been swept clean for me, and I have always had this protection every time I travel into these type of areas. I am very grateful for that fact. I situated myself to sit on top of my backpack. Since I carry a neck pillow for the plane I have been using it to sit upon and it is wonderful. I had my recorder in hand and started reciting the 22 Cosmic Rays of God. I realized with St. Germain’s help that my ceremonies have changed on this trip, and am reciting the rays with the definition and colors to assist the land masses. The energies changed immediately. I also call upon Mother Earth, Father Sky, Grandfather Sun, Grandmother Earth, the Thunderbeings, the Cloud People, Stone People, Root Givers, Two-Leggeds, Four-Leggeds, Creepy Crawlers, the Winged Ones, and Finned Ones and All of the Creation of Sentinent Beings to come together in Oneness. I knew this ceremony was different. I had traveled far and wide to arrive in this place of creation. I have spent many years working on my inner healing on an emotional, mental, and physical level so I could come into balance within my own God Essence of my I Am Presence within the physical body. I spoke to the Great White Spirit and the Spirit Keeper of the mountain. All were silent as they listened to my story and how I arrived in this beautiful place. Not a soul came by; I was with nature, God, and the magical mountain of Mt. Shasta as the silence was golden. First of all, I have to thank Joshua David Stone for his teachings and his life. Without his work I would not be where I have arrived. The ascension work changed my life entirely, and now I am teaching it to others in my own style. Joshua has been with me during this trip so heavily, and I am so grateful for his friendship and light onto my life. Mt. Shasta is a second home to me. It became so the day that I met High Priest Adama in 2001 at Dr. Stone’s Wesak Festival. Dearest Adama came up to me in the auditorium and told me he had just moved to Mt. Shasta. He said it was a very magical place. Now I know he was more than just an ordinary being but in that moment, I did not realize that it was “Adama”. He called himself Adam and he very lightly touched his forefingers onto my throat and smiled very deeply at me. He said “You are very sweet.” With that he walked away. I realized then that he was “the Adama” and mentioned it to my friend. I immediately left the auditorium and drove up the mountain to do a meditation into Telos. That was the beginning of my search to be part of these energies. He has never left my side since. As I sat amongst this portal of light, which Adama shared with me that this was a portal to align individuals with the Telosian energies. It was not a portal, parse to transfer one’s body into the City of Telos. I looked back upon my life and when I traveled to Mt. Shasta three years ago also alone. I was hit physically on that trip and really purged massive amounts of toxins within my physical being. I spent most of the time meditating in Panther Meadows as I could not travel very far. It was a very challenging trip. I dreamed at that time that I went into Telos through the tunnel but I never saw myself return. This is exactly what happened for me. Six months later I had a car accident in which I was hit four times. I saw the Angel of Death two weeks before and was told I needed to take care of my self-love. I did as he asked and it did not occur to me what was about to happen. I was saved from that accident due to my ability to move out of the space I was mentally living in presently. I walked away with cracked ribs, banged up knee and bruises but I walked out of the hospital two hours later. Everyone was shocked that I was alive. I know I was saved by Spirit and especially my dearest friend, Master Babaji. Six months afterwards I traveled to Florida to stay at a secluded home of a relative to take care of my emotional and feminine energies. I had been hurting for six months emotionally. While being there, I saw the other part of my soul, from Telos, emerge out of the ocean and join me on the beach. On that day I was realigned with my Goddess Self. It has taken me another 18 months since that time to fully embrace my God and Goddess self. This past year has been a blessing for me. I am teaching others, I was let go in my corporate job, I embraced my spirituality like never before and actually saw my manifestations occur within my life. In the past three months I have been communicating with some very important fifth dimensional beings that have helped me tremendously. They are in body physically but I do not have a physical relationship with them. I am unsure if I will ever have a physical relationship but their higher consciousness has helped me in ways that I cannot explain. I have embraced my Goddess Self in a way that I never thought possible. As I sat in this space, I spoke about everything I have explained here and cried very deeply. It was not of sadness but of great love to all of these Masters, Angels, and Light Beings who have molded my world. I am honored that I have come to place of existence that allows me to be in both worlds and to show others that all of this is possible. On this day I have been pledged as a fully Ascended Master walking this Earth. I have never been able to say this before although my closes friends tell me at very appropriate moments. You have come a very long way and you have shown to us your courage, stamina, the ability to walk a path that some would not dare to tread. We are honored to be here with you today, and will be working with you more closely. Your energies have changed greatly and each person you have thought about, interacted with, and stated their name in your opening ceremony, area all part of these energies. They, too, will be affected by your moments here in Mt. Shasta. You are now being attuned to the Telosian energies and can help people just by speaking and touching them. Your healing work is going to increase and many will be affected by your energies. The old way of journaling, writing, and utilizing traditional therapy routes will no longer exist for you. You are going to assist people in highly technical electro-magnetic energies. In turn, they will be able to assist others. Your role in the present circumstances is to help individuals to move into the fifth dimensional frequency within their bodies. We thank you for assisting in this manner. We know that your pathway has been challenging but so very rewarding within your heart. You have shown us your love, acceptance, and complete understanding of each moment. You have walked through many areas of fear, obstinance, self inflicted judgments, and lower energy thoughts. These are now all gone. We thank you for working as an Ambassador of the New Earth and Telosian Eneriges. We look forward to our growth of this planet together. Thank you for taking on the challenge of this trip. Your life is now about to change and we are here to assist. We will speak more about the details that will occur. Please come to Lower Panther Meadows tomorrow, and we shall meet you there. I sat in awe of what I had just received and know in my heart that I have accomplished a wonderful point in my life. I am at the top of the mountain and the journey has been unbelievably challenging, sad, lonely, and very strenuous in my ways, but I can say that I feel the beauty of my Light onto this body as I have accomplished so much in these past few days. I knew it was time to arise. I left some gifts for the Earth and packed up my belongings to head back down the path towards my vehicle. 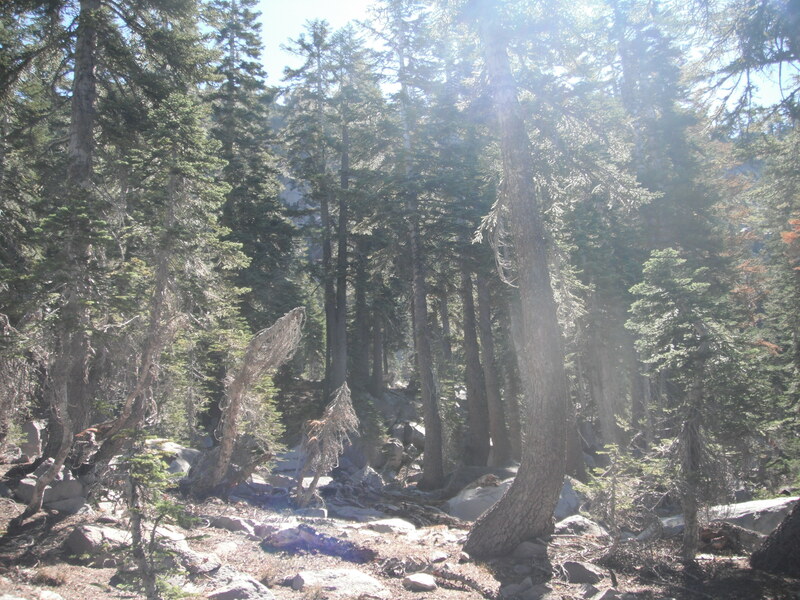 As I was walking down, I was in awe of where I hiked and what I had just experienced. I could not believe how far I had traveled in this moment, and all of the previous moments to create this beautiful existence I am fully embracing. It was still very cold as my fingers were freezing, and I felt like it should be January due to the elements I encountered during this day. I drove down the mountain in complete exhilaration of my life and what I have accomplished. This afternoon I was very shaky, dizzy, and very off center. I have taken the time to readjust my energies and chose not to travel to Crystal Lake which is another powerful spot. 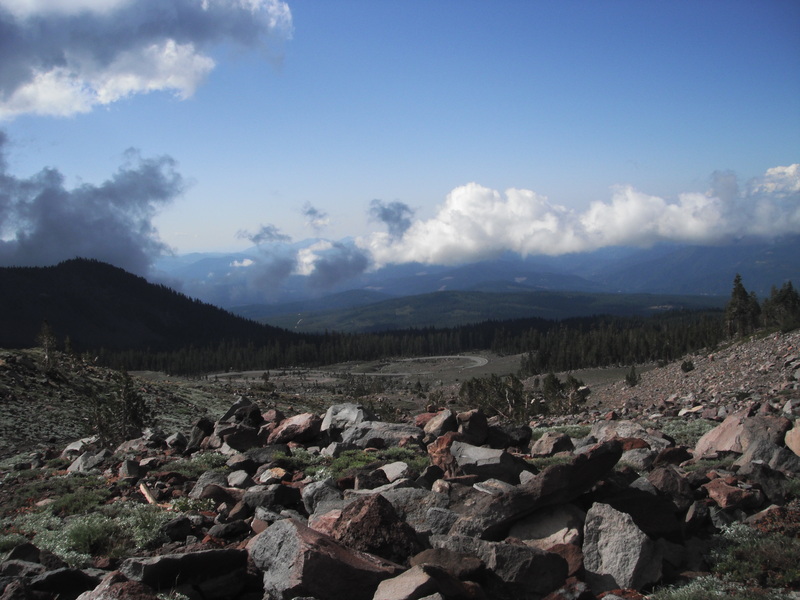 Tomorrow I will be traveling to Lower Panther Meadows on the advice of St. Germain. I also believe that I will be going to Telos tonight more aware than the whole week. I hope you will intend to join me if you read this in time. Tomorrow will be my last day in Mt. Shasta. It has been an amazing journey and when St. Germain first asked me, I was unsure what it was about. I know my teachings will change for the better, and I want to share so much with others about the magic of life. I have moved very deeply into Love Consciousness in the last few months and the Telosians represent this status. Most of us lived in Lemuria and this is what the New Earth is going to be about. I am grateful that I can be one of the individuals to assist others in this pathway of the Golden Age. Since I was having computer issues at the house, I found out that a phone call could be made to Betty’s (the owner of the guesthouse) computer geek. Also one of my housemate’s was having similar internet issues which made me feel better. There was not going to be an immediate solution so I hightailed it to one of the local coffee houses. Things have changed so drastically in just one year. Our usual Telsoian gathering café is now a Mexican café and even the clientele have changed. I checked out another one at the other end of town, and they no longer have internet service but boy, were they crowded. I guess that’s where the townies all meet now. I went back to the Mexican café and promptly found a space to connect with the internet. After completing the tasks that needed to be done, it was still cold and damp so I decided that I would do some shopping in some of our favorite eclectic shops. One is called “Soul Connection” and is an amazing store. I felt I needed to find a particular book, why I do not know since I need to get rid of some of my books, when I felt Adama’s energy and he said hello. 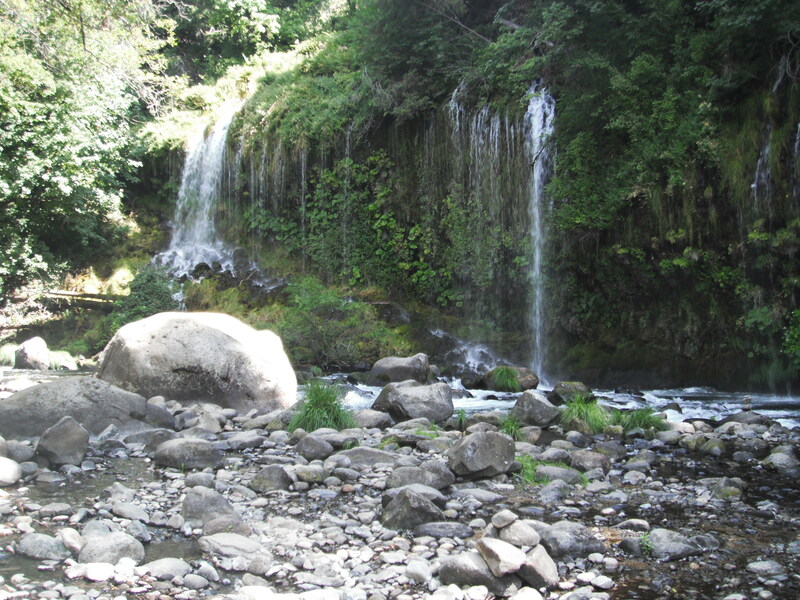 I asked him if he needed me and he said, “Yes, we need you to drive to Hedge Creek Falls in Dunsmuir.” I asked of the urgency and he said, “Immediately.” So I purchased the book I was looking for and went south back to Dunsmuir for another adventure. partner to finish. 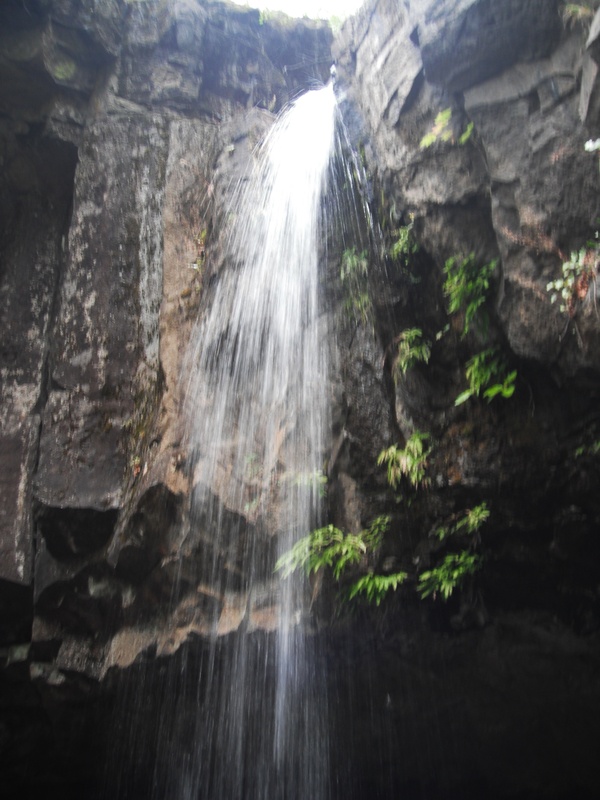 I was busy taking a video in the cave so I was looking out towards the waterfall. When I was finished, they came by and I spoke with them. They were in awe of the beauty of the falls and I told them about Moss Brae which is just down the road as I explained the long walk on the railroad tracks. They were of foreign descent but spoke excellent English. She said that they definitely were going there right now and he smiled as they walked past me. At this point, I was unsure if they were Telosians here to check up on me or actual humans that needed assistance. You never know in Mt. Shasta when you are going to be put on notice. I just love sharing with others about the beauty and wonders in the area. 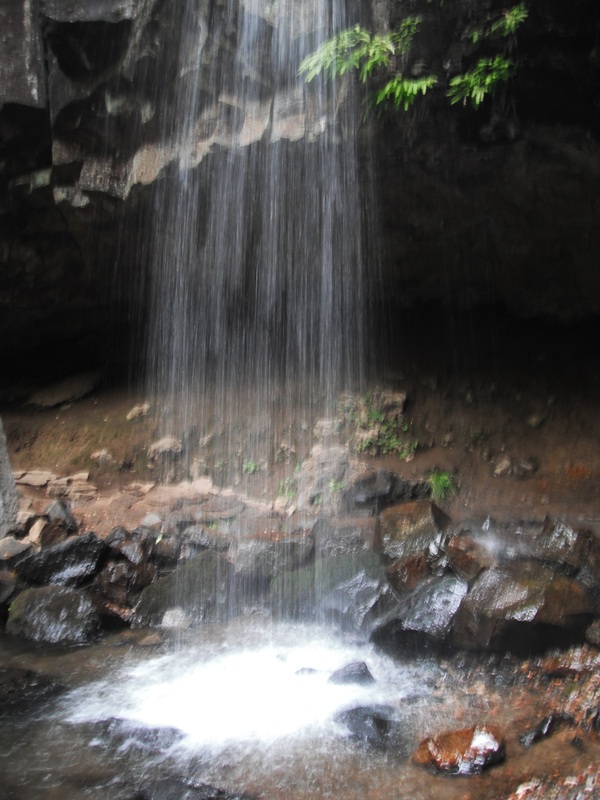 I then sat down on a log that was facing into the falls looking at the deepness of the cave. I was guided once again to call in all of the 22 Rays of God on the cosmic level along with activating all of the Earth energies for assistance. I realized that as I am doing this work that the cosmic energies are coming into the land masses to assist not only the environment but the masses of people that are traveling to these areas. I have done many medicine wheel ceremonies in Mt. Shasta in which the Masters have told me how much it has assisted the area, but never before have I used the Rays of God in this manner. I then started channeling the Elohim of God energies as they came through song in my voice. The vibration of the area changed drastically and I felt such glee within my Being. The spot where the water falls into is a small pool and if weather conditions were different, I would have stood under that spot as I did last year. I felt the energies of the pool of water and knew that it was a portal to Telos. The Elohim then guided me into the pool of water through my mind’s eye as I transferred my Spirit swirling in a clockwise manner through the portal feeling myself in a crystalline tunnel no bigger than my Light Body. I was spinning downwards and then felt myself in an entrance way to Telos. It was not the city itself but almost a reception area. As I stood there, I saw many Telosians and then five very familiar gentlemen. These were the guys from yesterday that had come to Moss Brae Falls with inner tubes going into the river. Then I realized that they were also Telosians coming by to either say hello or they were watchers. It was a moment of recognition for me that what I was experiencing was very real. You see, Judy, my traveling buddy is usually the one that picks up on these interactions with people and without her with me I had to rely on my own physical feelings, not just an intuitive sense. I then knew it was time to leave and was told that I could utilize this portal at any time. There are so many of these portals all over the Mt. 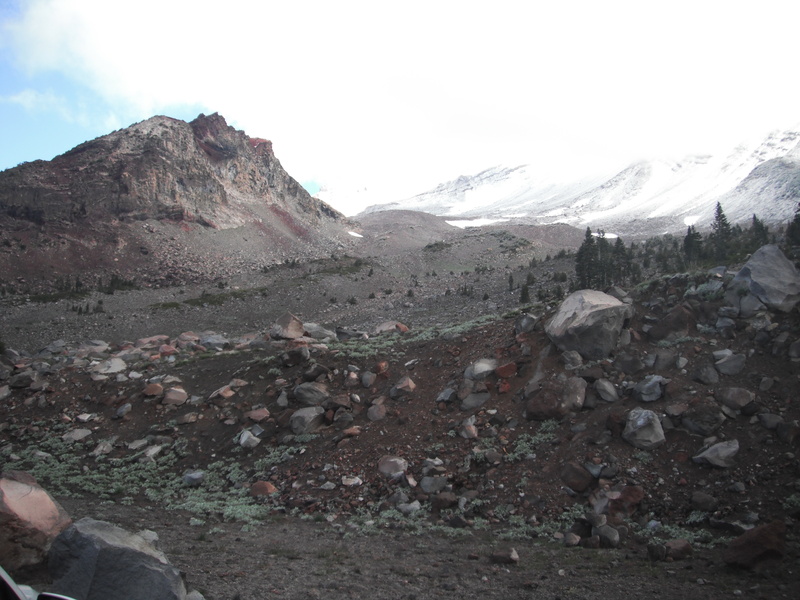 Shasta area and each one is guided and protected by the Telosian people. I came back up through the portal and felt myself return into my body. Again, a change had taken place. More activation but this time it was not uncomfortable although at first, I felt a bit ungrounded. It was then time for me to move on; my work had been completed. I walked up the pathway to return to my car and immediately felt High Priest Adama and Dr. Joshua David Stone. Joshua was my mentor and I still continue to connect with him concerning my ascension work. He has helped me tremendously to be the teacher I have become. I felt they were walking with me; not in front or in back of me but all of us together. The connection was unbelievable for me to be walking hand-in-hand with these great masters and here I was in body, a simple woman from Southern New Jersey. How did I get to this point in my life. I am in awe every moment of the pathway I have chosen and the challenges I had to endure but I have survived it all. I survived death a couple of times and came out of it a much better person. I have healed internally and externally beyond my wildest dreams and now my life is changing once again. I am receiving all that I have wanted to create but until you get to this point, you can only dream. It is no longer a dream, it is a reality for me. Dearest Adama and Joshua have asked me to do something that I have thought about doing but not quite sure if I could create it fully. I cannot impart to you in this moment what it is they spoke about on our trip back up the pathway but it is very huge. It is about my teachings and helping to create the New Earth. Tomorrow is another day and I will have more concrete information at that time. I am a fully integrated being in a fifth dimensional body and moving into a higher dimension as I share my journey with you. I then drove back to Mt. Shasta, stopped and ate a salad. 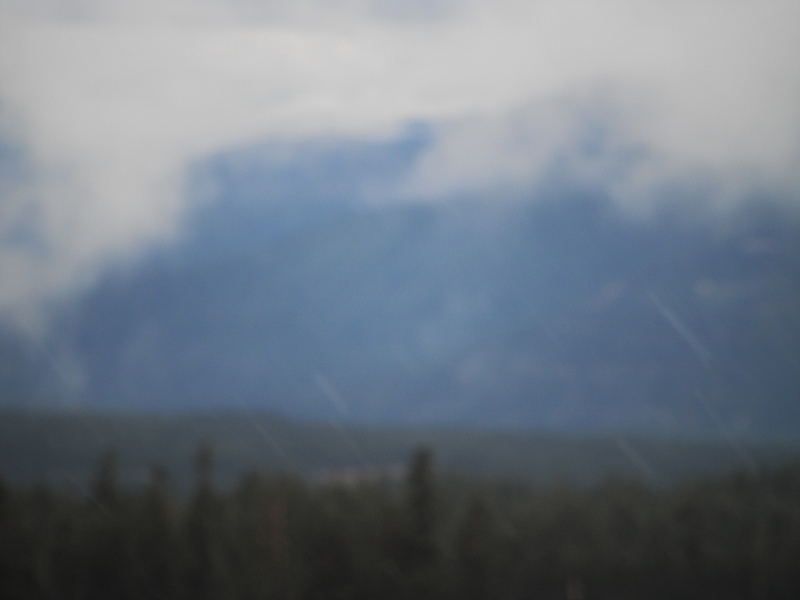 I wanted to travel up to the mountain as it looked like the clouds were lifting off the peaks. I needed to recharge my camera so I took some downtime in my room. About 6 p.m. 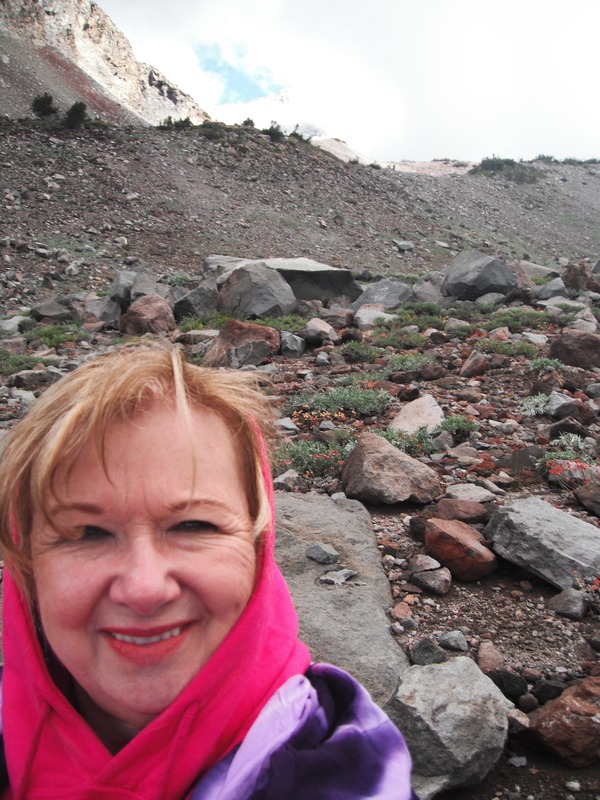 I started up the mountain and the energies were so new and fresh after the rains. I was just about at the top which is 7,000 feet when it started snowing. How pristine and beautiful. I got out of my car to take some pictures although most of the clouds were still overhanging. Across the horizon, the sky was deep blue and white as the clouds were lifting in the distance and at a lower altitude. It was a beautiful site to behold. I now feel it is time for me to make that hike up the mountain to my destiny. If the weather is bad tomorrow, I will wait until Monday which would be appropriate since it is my last day here in Mt. Shasta. I do not have any anxiety about the trek as I did two days ago. I am very secure and balanced within my Being. I am looking forward to another adventure in Mt. Shasta and am happy to share the energies with each of you. Adama told me today that each person I mentioned in the opening ceremony has been visiting Telos during their sleep state and I also have mentioned others since that time. You may not remember but if you are going through some trials or initiations on your own, please know that you are being guided greatly into a new facet of your life. You never know what can happen from each moment to the next. When I went to sleep last night, I was ready to arise at 6 am and prepare to hike up the mountain to a place I felt was important for me to experience. I could not wake up; I arose but then fell back down again until 8 a.m. This frustrated me as I felt I was letting the Ascended Masters that are working with me down. I had failed to do my best. So then there was the guilt which was worse has it was self inflicted. I realized that I was being worked on so intensely that there wasn’t any way that I could perform the task that was previously set before me. The evening before Master Adama told me that my plans may need to be changed and well, he was correct. 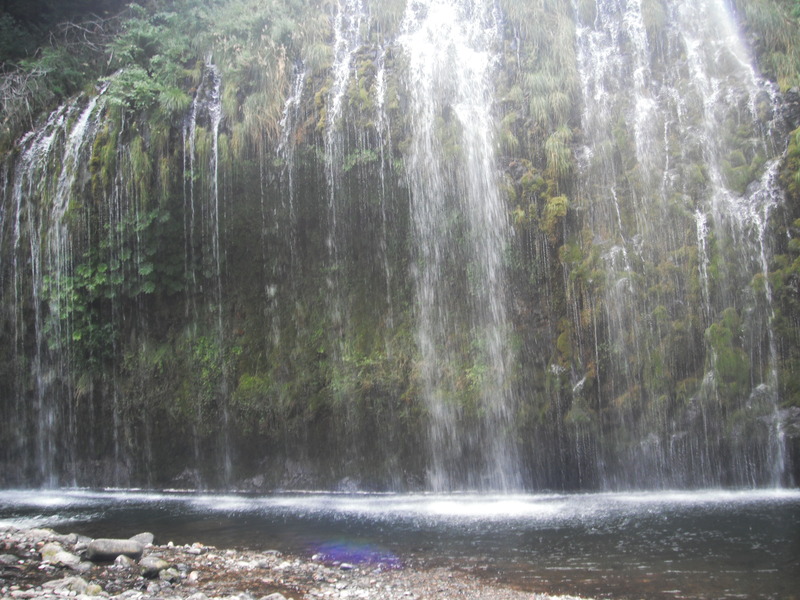 I decided which the advice of both Adama and St. Germain that I would travel to Moss Brae Falls in Dunsmuir which is the next town south of Mt. Shasta. It is a very powerful place and I knew that it would be an intense trip. Besides that, I have taken this excursion before and knew what was before me. You have to walk down railroad tracks for one mile. 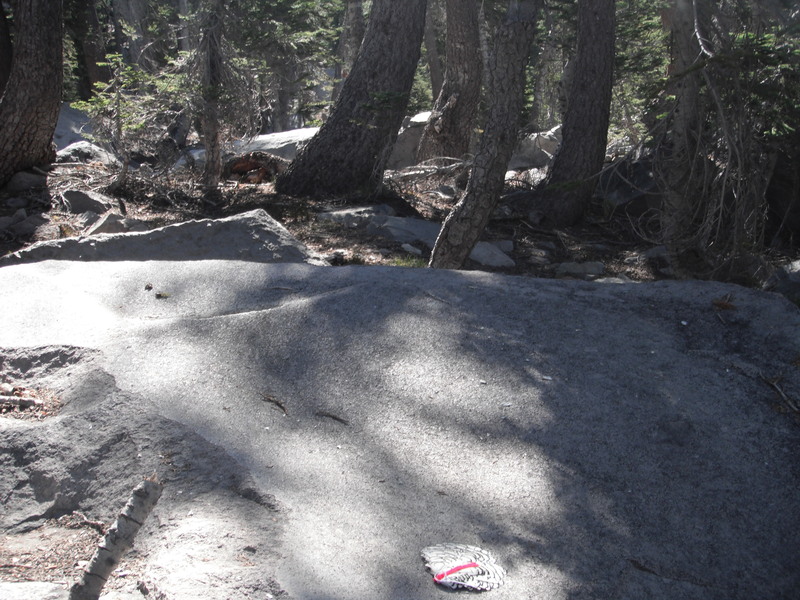 It is not an easy feat as you are walking across the railroad planks and the spaces are filled with huge rocks. It is a walk in which one needs to be very connected with what they are doing in each moment. The issues I have had with my equilibrium previously was quite a challenge. I arrived at the point of origin after having a healthy breakfast in Big Bear Diner, the hot spot in Mt. Shasta. I had my walking stick in hand along with my backpack filled with power bars, water, a towel and incidentals. When I started walking, I heard above my head a noise as a raven sweeped to my left side but behind me. I felt that I was walking into the magic and I was guiding myself instead of him being in front of me. As I walked from plank to plank, I start chanting “Om Nam Shivaya” and found this really helped me along with integrating the Emerald Green Ray of Harmony and Balance to help with my grounding issues. I felt as if I was walking on a cloud, moving from each plan to another. What a difference. I stopped to take some pictures of the Sacramento River to my right as the view was amazing. The time went pretty quickly which I was surprised. I only passed one other party of individuals which was quite a difference from last year but we were there on a Saturday. I saw ahead the bridge on the tracks and new the entrance was to my right. I was excited. others. Please check out the video link. There was one boulder that seemed to fit the bill for me to create a ceremony. I had dry sage which I crumbled up around where I was sitting and was in complete awe of being here in this space on my own by the guidance of the great masters in my life. It makes me feel so grateful for the gifts that I have opened up this lifetime and am able to share a world that many wish to do so. I set up the ceremony of connecting to the Native energies. I sat back on the boulder and decided to record the sound of the water which I thought would be wonderful to share with others. I found myself situated so I could face the falls and started seeing amazing faces in the water. I then got out my camera again and tried to do some close-ups. I cannot share all of them here but will put together a video of the entire trip which I feel will be awesome. In the meantime a young couple appeared and situated themselves on another boulder. They were not friendly and I was having a hard time connecting with them there. I knew St. Germain was very prevalent not only through my consciousness but through the energies of the fall. 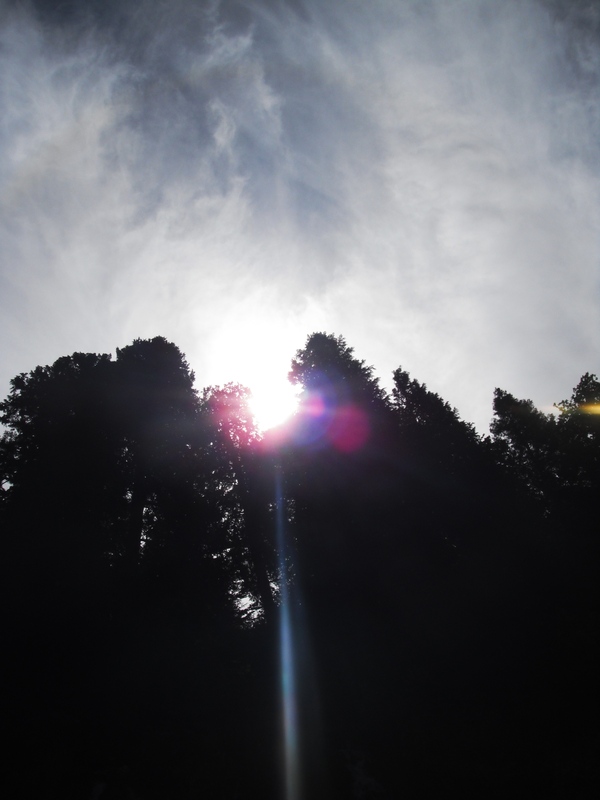 I also took a picture of the sun and the Violet Flame was very apparent in the scenery. I then decided to call upon each of the 22 Cosmic Rays to assist the area. Shortly thereafter, my two friends exited the area of the falls. I breathed deeply into my being and felt the cosmic energies coming through the entire space. I then asked for a Golden White Ascension column to come down into the area to assist the energies of so many people visiting there continually. At this time, I heard Adama saying, “Christine, it is time. Please go into the water and refresh your energies.” Now I know this water is very cold but I was not prepared for the intensity of this moment. I had worn my bathing suit underneath my clothes so I immediately did what I was told, like a child obeying it’s mother. Always for my higher good…. I put my feet into the water and I thought, ‘no way.’ I continually think about Judy, my traveling companion, because I always push her to get into these freezing waters to purge her energies. So today I needed to take my own advice. I kept trying to find a way around the shoreline that would make it easier. Not so; I moved into an area where the water was not running as swiftly and walked into the water all the while thinking, “it is not cold, it is not cold..” I finally bent down and immersed myself to my waist and then just started splashing everywhere. I knew my head needed to be submerged as all chakras needed to be part of the process. I splashed water onto my face and then dunked my head all the while, screaming which was echoing loudly as if I was in a amphitheater. At this time, a young Japanese family came down and were smiling at me. They were so very sweet and I connected with the little girl, about age 5 or 6. She immediately took stripped to her bathing suit and went into the water but ran out again. I am thinking, “usually children will do anything but look how smart she is. I was laughing to myself.” I then dried off and knew my work was not finished. I stood against the boulder and connected with the waters. I felt Telosians standing around me along with many masters. I was not alone at all. I looked up and heard St. Germain, “Let’s converse.” He then explained to me about the levels of the water coming down the wall. It was like there were steps. I counted the steps and there were about 7 of them. He told me that each of those levels represent the higher energies coming down into the body of water. Think of the water as the physical body and the water being the higher frequencies. “You were asked to immerse in the water, not because of purging your old self, but to integrate these Telosian waters into your physical body. You have been attuned to a higher frequency that is going to assist you in working with others to command the 5th dimensional body of light in your sessions.” He went on to explain that I have an ability to utilize the water frequency with others and I had the feeling at the time that it meant to change one’s internal system through these light frequencies but also to attune the actual water content in specific areas. He did not explain this in depth and I am still very unsure how this is going to occur but know that something very deep happened to me in these moments. I then knew that it was time to leave. I packed up my things and said farewell to my new friends. 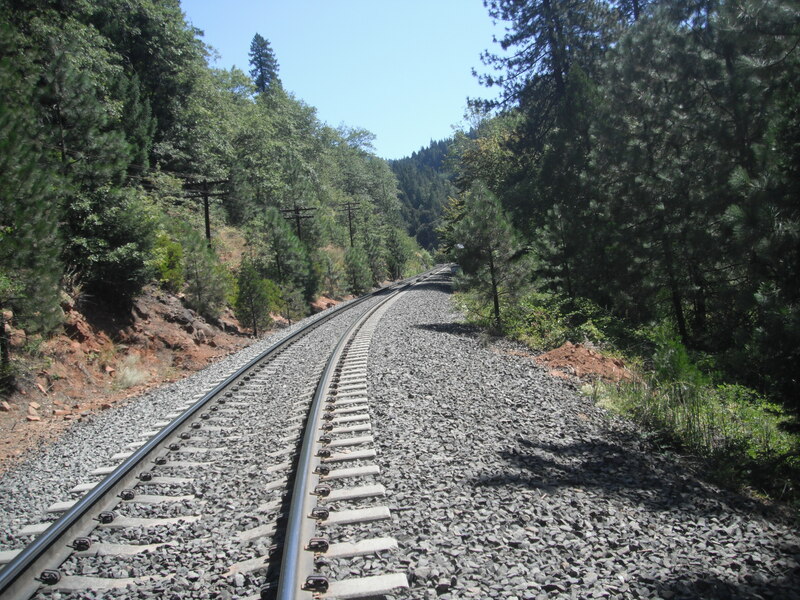 As I was walking back down the railroad tracks, St. Germain spoke to me personally about what I was experiencing and told me he was very impressed in my pathway on this day. I was told that this was quite a challenge; the walk on the tracks, the energies in the fall area, and accessing it alone without anyone else. As I was walking, I felt more grounded but more in a higher state as if I was just easily floating from one plank to the other. I was in the flow. This has never happened to me before. I would be in a higher state and then I would trip and fall off my feet. During this walk today I only tripped two or three times on some stones which is amazing for me. For years my father always worried about my equilibrium and I was always falling on my knees. Today I felt balanced and focused but yet in a higher state of awareness. As I stopped on the tracks to drink some water, my Japanese friends passed by me. We met up again on the road where our cars were parked and we spoke for a short time. We never did exchange names but the young woman was very intrigued by my energies and she was asking me if I meditate. I told them what I do and I was here in Mt. Shasta on an inner spiritual journey to rejuvenate my spirit. They were from Los Angeles and very new in this country of only two years. I guided them where they could go, like Panther Meadows, to feel the energies. I just find it so interesting that they were Japanese origin but did not know how to connect with their higher self. I was happy that I could be of service to them. I came back to town and stopped for a great dinner at Mexican restaurant, Judy’s favorite, and enjoyed a margarita. I have been relaxing since then and intend to retire early. Seems the internet is not working tonight so I guess Spirit said I needed a rest. I hope to upload this blog tomorrow sometime. Now Adama has informed me I am ready for the trek up the mountain to a very special portal but the weather is threatening tomorrow. So we shall see what this moment brings. It was a great lesson this morning to be in the moment and know that everything is Divinely Guided even when you think that you have failed but yet you have not. Timing is everything and changes in each moment. Another day has come and gone with more energies being infused within my being. As one that has been on this path for over two decades, you think that you would be accustomed to the infusing energies that are a direct result of Spirit working through you. Alas, it never stops and the onion is always peeling away layer by layer. Very interesting event happened to me last night when I was finishing up the blog and uploading yet another recording of the Full Moon call on Sunday. It was getting late and with a loud noise, the lights went out and on. So I said, “Okay, I am coming.” I knew the Telosians and the Light Beings wanted me in Telos and I was taking too long. Another manifestation of Spirit working in my life. As I was trying to sleep, I started feeling some strange energies that were not present previously. I always ask if they are in the Light, and they said no. Many souls were becking at my door to my room from the hallway. I am staying in a guesthouse that originally was a hostel and the owner, Betty, informed me to keep the doors locked as the hikers still think it is a hostel. So then I realized that for the eleven years she ran this space as a hostel, many souls came in and out. They were looking for assistance so I sent them on their way. Each time I travel, I always bring with me my ‘clearing salt’ and ‘Clearing Space Spray’. This time I forgot the salt which does not mean I could not make more, but I realized it was time to utilize the energies fully from the God Force through me now that I have come into this new space of existence. I utilize the Golden Ray into my being, and input it through the ceilings and floors through my fingertips. This sometimes can attract wayward spirits as they are looking to move into the Light. These souls were definitely attracted to this Light but could not enter my room. Another form of actualization of what I am creating in my life. In the morning I awoke groggy and not grounded. Too many energies in my sleep state as I know I am traveling to Telos to connect with the Beings of Light, my soul sisters and brothers. I decided to take my time and why push myself which is not the usual way for me. My goal on this trip is to be ‘in the moment’ and not rush towards those moments. I took time to eat a light breakfast on the deck, watching the beautiful mountain and listening to the hummingbirds flying around. There were not as many today as yesterday but the joy of their light is amazing. I stopped at our (my friend, Judy, and I traveling here extensively) coffee shop and it was different. No familiar faces, and it was empty which is very unusual. Of course, it was later in the morning hours. I drove up to the mountain, again tearing greatly feeling the love and joy that is coming to me from the Telosians, High Priest Adama, and St. Germain. I feel so very special to receive these moments from them. I also was anticipating newer energies coming to me and within that, was anxiousness of the reality of it all. I knew I needed to travel into Upper Panther Meadows which is a place of joy and pure bliss. As I walked up towards the path, the entryway had been changed but it was so much better. The old way was to trek up the deep hill and then a steep downward climb into the meadow. Now the path went to the right and around between the trees making the walk much easier. As I came down into the meadow, the bliss of the flowers amongst the greenery is something that one can only imagine. The essence of this meadow burns a beautiful light within your heart and you are changed forever. Breathing deeply I continued to walk. I met a few comrades along the path and as always, I love to exchange stories. A met a couple of young girls that were camping out and traveling together. It was special to see their exuberance as they shared their journey with me. 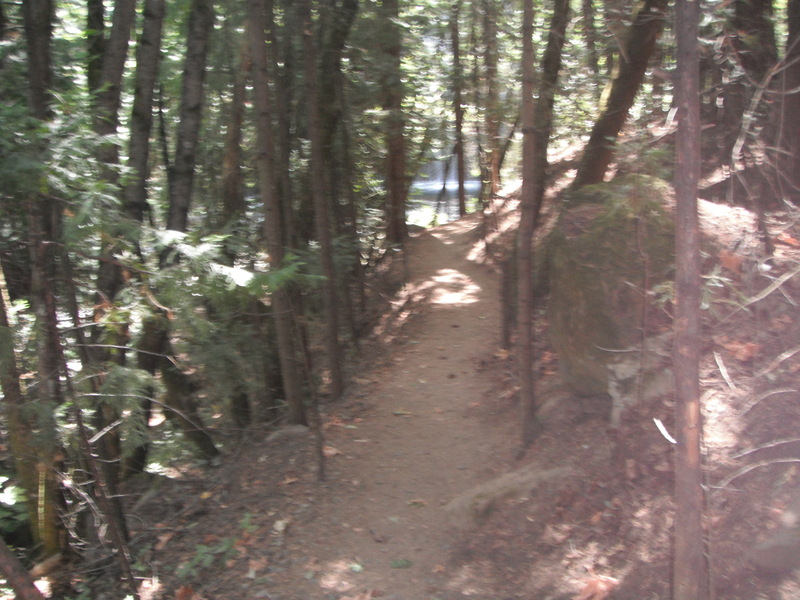 I walked through the meadow along the pathway which takes you through some rock formations. I stood at the end and heard Adama, “You must get off the Beaten Track.” I knew that my connections needed to be in private. I looked to my left and walked up through the barren woods with many rock formations trying to decide which way to go when I looked up and saw a man coming down from the woods towards the meadow. He was quite a few hundred yards away and did not look at me but instantly, I knew he was more than just a fellow hiker. He was slender with dark hair and a goatee wearing khaki shorts and sandals. The sandals are always a good giveaway that someone is from Telos. They are the only ones I know have that can walk across those rocks and not be wearing hiking shoes of some kind. I took a deep breath and realized my connection to him was spiritual and that he was a guide. I did receive confirmation that he was Saint Germain. I was also told by Adama that this boulder would be a light portal to Telos. I then looked up and there it was. It was not too high that I could not perch myself up upon. I looked beyond the boulder into the woods and there was a heavy mist so I knew I had found the right spot. I then took a couple of pictures which are shown here. This was my day to connect with Adama and Saint Germain stayed in the background. I grounded myself in preparation for my journey down the pathway. As I was walking back through Panther Meadows, I took another deep breath and felt a surge of energy run through me. The bliss of this land is amazing and runs right through your heart. As I was walking back, I met two wonderful beings of Light, a wonderfully love-filled couple. They definitely were a soul connection for me, and I felt so wonderful to meet them once again. We shared stories standing there about Adama and Telos, and promised to speak further while I was staying in Mt. Shasta. They were such a beautiful beam of Light, full of bliss and love, giving me hope that many of us will receive our True Partners very soon. 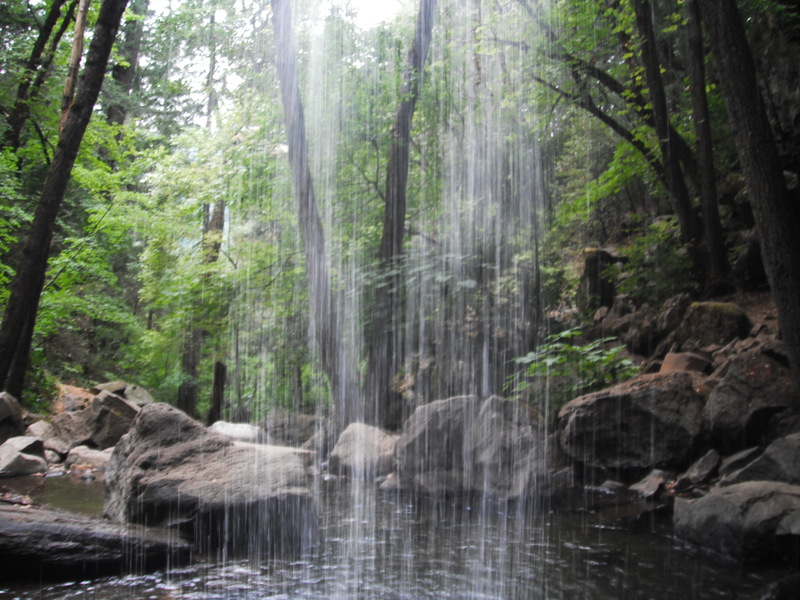 I traveled back down the mountain and prepared myself to take a swim in the mountain waters. I was very surprised that it was not colder than I felt. The weather has been very hot here in Mt. Shasta this summer. I walked into the water and felt the rocks underneath my feet as the grounding energies ran through me. I connected with Gaia and the core of this lake. I asked for the Spirit Keeper to assist me with my journey. It took me right back as a child swimming in a lake in Pennsylvania where my mother spent her summers “Eaglesmere” as it was pure mountain water. 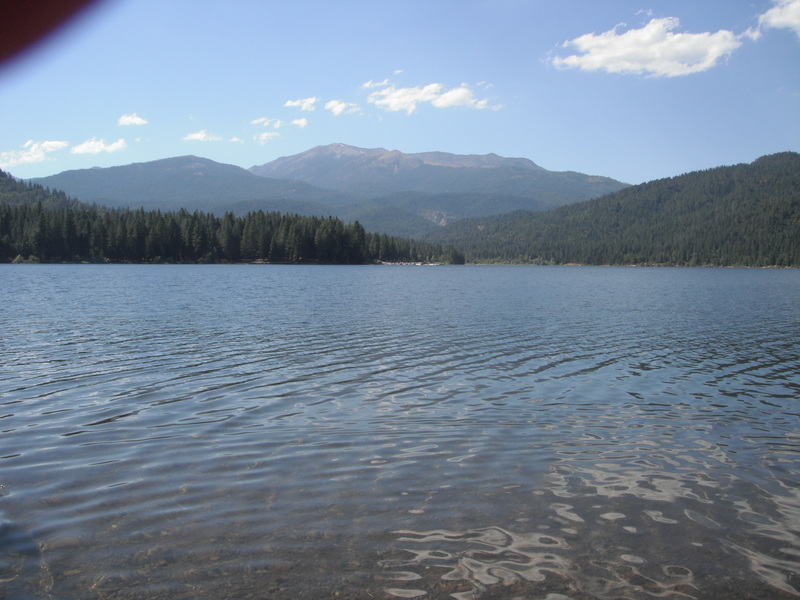 Here you are lying in the water looking up at the mountains around you – what pure bliss this is….and seeing Mt. 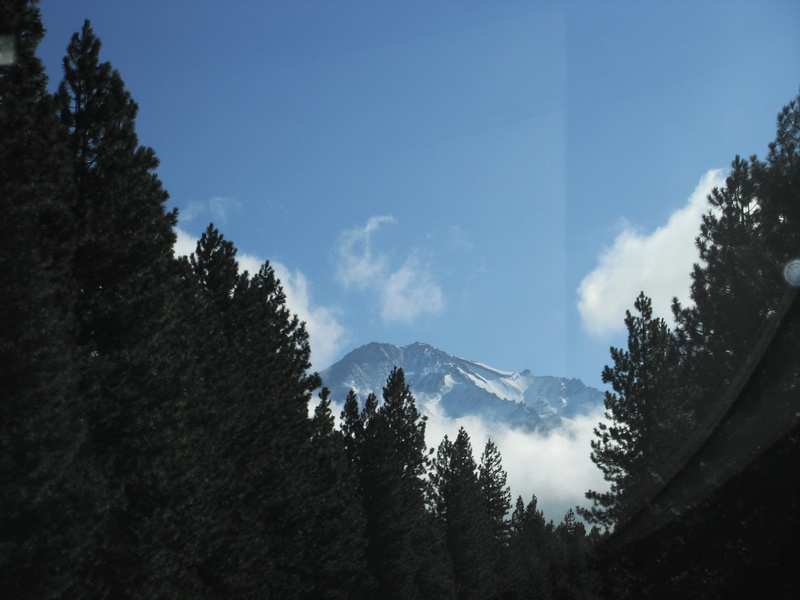 Shasta beaming with streams of snow in front of your eyes. I asked to be purged of any additional energies and immersed myself while swimming underwater. It was a wonderful time. I returned back to my own space and found myself falling asleep again. I know the energies today are preparing me for great changes tomorrow. I decided to go out to dinner at a restaurant called, “Lillies” which is a beautiful place aligned with white lights. It felt good to celebrate myself. I saved a glass of wine for later as I know tomorrow is a very important day. I came back to the guesthouse and met two new people arriving for a few days. We instantly connected and again, Spirit, has put me in the right location at the right time. I truly look forward to sharing with them in the next few days. So what does tomorrow bring? Another hiking expedition except this one is big. 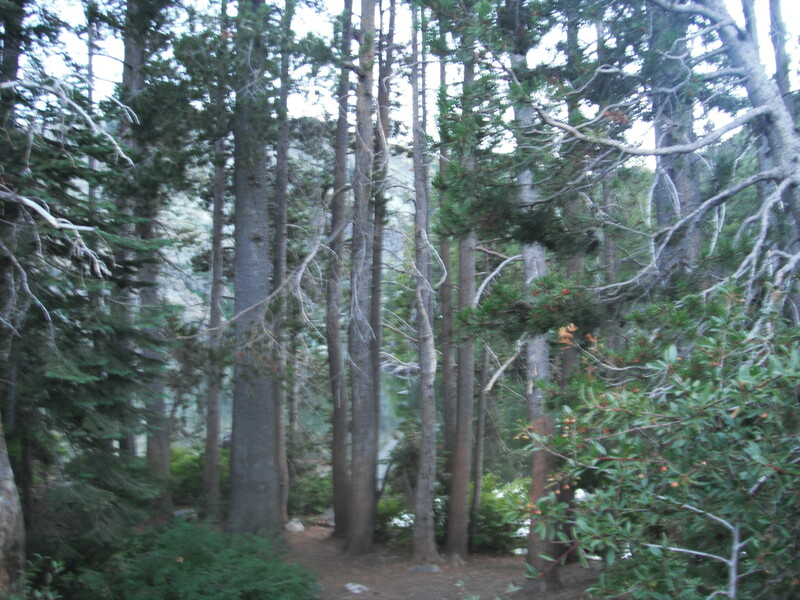 I am going to the top parking lot and hiking up the mountain to a spot which I feel is a special alignment for me. I have wanted to do this previously but was not ready to do so physically. I am challenged physically with extra weight on my legs, but am very intense with my exercise and have been receiving wonderful healing treatments for the pain I held within my legs for years. That has now been dissipated and my legs are strong. I need to make this journey not only for myself spiritually but most of all physically. What do I expect? More energy connections and a deeper connection with St. Germain as he is the one that I have been working with very closely for several years. I am fully activated under the 7th Ray of Ceremonial Magic under his command and know that this journey tomorrow is an activation of more teachings for me in a different manner. I hope to be able to see him physically but if not, I will see him in the 5th dimension as I have had previous encounters. I am excited, exhilarated, and of course, anxious but am ready to move forward onto this path that I have been actively working with for eons of time. The journey of Light and Love continues within me. I have been in Mt. Shasta for 24 hours and already feel a difference within my Beingness. I left my home in Southern New Jersey at 4 a.m. EST on Tuesday, August 24th, 2010. I had barely an hour of sleep with trying to get recordings uploaded so I could share with my students before I left. I was guided by St. Germain and High Priest Adama, from Telos to come to Mt. 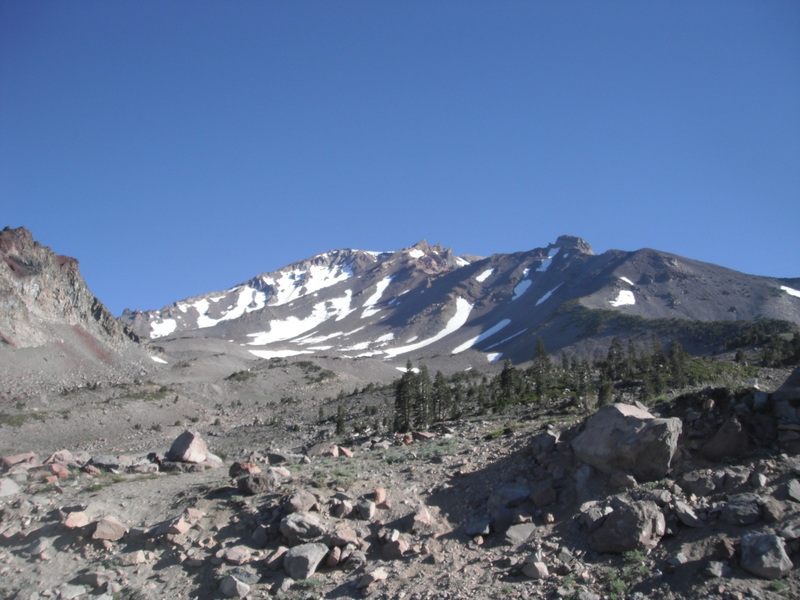 Shasta in August. I asked for doorways to occur as I had no clue how this trip was being paid for. Well, the monies arrived and the doorways opened. I had amazing connections between two flights of meeting two special ladies that were joining their families in Sacramento. I felt my energies being shown to others in the mainstream of society by just showing great love everywhere I turned. I slept on the planes but who sleeps well in the air. As I left Sacramento, above my head was a Golden Hawk which to me is very representative of my guidance of the Cosmic Great Central Sun. I was so appreciative of the message and know that my journey is being guided by the Golden Ray of the Cosmic Energies. The drive from Sacramento to Mt. Shasta is about 200 miles, and it was the longest journey that I have ever taken. I felt it represented my inner journey as it has taken me almost 30 years to fully activate the levels of consciousness within my cellular memory. I stopped twice for coffee as it was challenging. I was already experiencing being in both worlds of the 5th and 4th dimensions. I arrived at my destination of Alpenrose Cottage. If you ever come to Mt. Shasta, please check out the beauty of this guesthouse. I am in a room off a large deck facing the mountain and can see the mountain when I sleep. It has a private bath with a huge kitchen and living area. 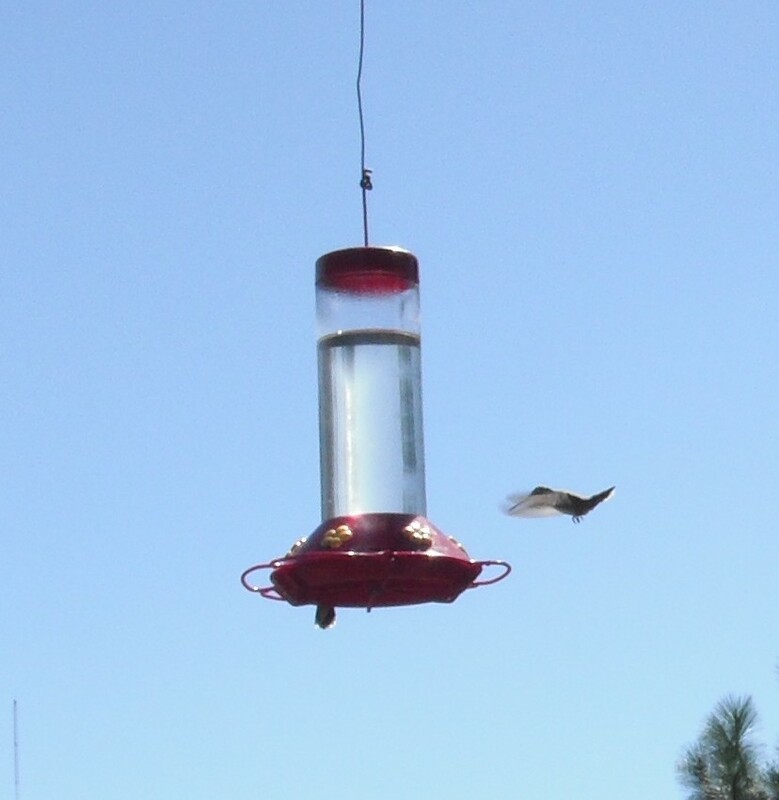 As I walked out on the deck outside my room, there were about 50 hummingbirds flying around a feeder that Betty, the owner of the guesthouse has hanging up filled with sugar water. I stood there and they were kissing my aura. I felt the tears of joy running through me as they were connecting to my Spirit. She explained to me that these were the babies, and they would be migrating very soon. It was such a blessing to watch. What a message of joy expressing my journey. This morning I had some glitches with my physical energies, third eye and solar plexus issues, which can sometimes occur in higher altitudes which I am not accustomed within my environment. As I drove out of the driveway, a light came on my car. Thank you, Mercury Retrograde for showing me your energies. It turned out to be the tire pressure, and I was able to take care of it easily and effortlessly. I finally arrived at the top of the majestic mountain as far as the road would take me. I could not hike far. The headache was making me very off center so I found a quiet place facing the mountain. Right away the energies became very intense and I felt so welcome. You see, I have been traveling to this area for 11 years and only once before, was I alone. I called out the specific names of people who asked to connect with the energies. I worked with the Native and Telosian energies. I felt at peace. I was told by Adama that today was an integration day for me and that I should take care of myself physically. My body is being prepared for a great journey this week. Previously when I have come to Mt. Shasta, I always asked for advice. There is a book coming on these experiences as they have been intense. This time it is different. I am living each moment and know I will be in the right place. The beauty of this gift is amazing. I have been in a dream, a void of loving energies. I returned to town and did some food shopping as I know this trip is different. I bought greens and fruits to balance my energies. It helped so very much. I then slept for four hours. What an amazing sleep. The weather is very unseasonably hot for Mt. Shasta but the breeze is amazing. Not the humidity I am used to dealing with in New Jersey. I then had a call from Anna, who is a friend that owns another place to stay. Her lodging was not available so we had dinner together. I felt the connection with her unbelievable. I always liked Anna. She is very German and very straight-forward with direct honesty. She is a therapist and we discussed the need to help individuals raise their thought processes to help the healing. Now Anna is not in the same space as I am with my work, but there was a connection with each other — a common ground. This trip is about me connecting to people in a new and alive manner. The last time I traveled alone, I was hurting physically and needed time to just let the healing occur. I have come into a new space of my being and Anna noticed it. She told me how strong my aura was and very illuminating. It was a beautiful confirmation. 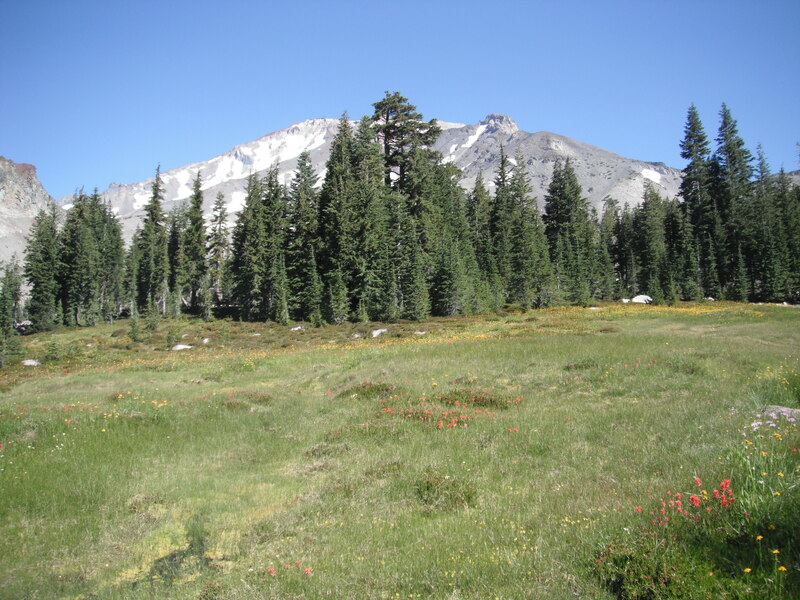 So tomorrow I am off to Panther Meadows which is very calming and inviting. No intense hiking until Friday. I do intend to go to the lake in the afternoon to cleanse and purge my presence in preparation for Friday’s journey up the mountain. I know which space I am going to travel as I have felt the need to do this for a few years but never had the courage. I am now ready to climb the journey of my entire souls’ life. Eons and eons ago we all lived on Lemuria in beautiful peaceful and extreme power. As men and women we were honored by each other as we honored ourselves. Internally we were very powerful, self-centered, loving, and expressed it to others. Life was in balance. And, then it all came tumbling down and we have been trying to get it back together ever since. So many lifetimes and years that each of us has been struggling to find our three-fold flame of the male, female, and divine complement (or God Essence) within us. There are many individuals that just seem to have the Midas Touch and everything they do turns to gold or riches. Then there are many of us who struggle at every twist and turn in our lives. Which one are you or possibly in between both categories? For myself, my spirituality was always the most important aspect in my life. I have gotten down and dirty within myself to pull up the debris, thoughts, feelings, and sometimes trauma to help me become unstuck. I know I came into this life to be on a spiritual path. I knew it in my teens but did not know how to get to it. My soul path has been one of being on this Earth for eons of time trying to do it over and over again. You would think I would learn…but alas, I am still here but now I am not just surviving, I am prospering. So how did I get to this point in my life? I realized that when I had a car accident two years ago that God was still not ready to have me even though I communicated with the Angel of Death two weeks before the accident. I did not know I was going to have an accident but knew that there was something within me I needed to change. So when this Angel of Death came to me, I said, “Okay, what is it you need? I thought it was a relative leaving the planet as I had experienced this greatly in the previous three years. But, no, he said I needed to change something within me.” In this moment I do not remember what it was but knew that it was very important. So I worked on myself with my spiritual tools of breathing, ray work, calling upon specific Masters, accelerating my light quotient and then I felt fine. Until that Sunday afternoon that I turned the corner of my house and was hit four times by two cars. Authorities were in shock. I walked away with a cracked rib, banged up knee and shoulder but literally walked out of the hospital. In the past year I was laid off my corporate job and was afforded the ability to fully work full time in my healing profession which I had been doing for over two decades. I started teaching via teleconferences and doing all of my sessions via telephone where previously they were in person. I found a whole new group of people that truly were interested in what I had to say. I became empowered within myself along with doing more internalization of my own inner feelings. The Ascended Masters are my best friends; I feel more at home with them than with third or fourth dimensional beings. I have transmuted so much of my old life that sometimes I felt it was easier to be in another space. In the past few months I have had the wonderful experience of communicating with the fifth dimensional energies in the form of individuals and feeling that essence within me. I have fully integrated more love consciousness within than I ever thought possible. I am preparing to assist others to do the same which brings me to this workshop I have put together. The Manifestation of the Divine Principle was an idea that came to me a few weeks ago since all of a sudden my manifestation abilities were skyrocketing beyond belief. I wanted to assist both men and women in their search for their Divine Complement. Each of us have been both so we have both characteristics within us. We need to empower ourselves both through the God and Goddess within. I have always been a person that can create miracles when needed and at the last minute. Presently I am creating every day and in unbelievable gifts, like traveling to Mt. Shasta next week. Individuals are coming onto my calls and receiving assistance. It is slow at first but I know it is going to be huge. I am also working with a small group of people to manifest a 5th dimensional healing center in the 4th dimension to help people accelerate their bodies to become fully integrated in the 5th dimension which is not an easy task. This workshop is a direct result of my own experience of integrating my male and female essence along with the God Presence within. When I say integrated, I mean physically. This is not a consciousness, it fully inhabits your body and you become one with Mother and Father God. It is a beautiful and powerful essence to behold and I am in awe that I am able to do this work and still be grounded. It is essential to ground this energy and also your I Am Presence fully to accelerate your physical being and allow the lower energies of the physical, emotional and mental to be integrated within your Higher Self and I AM. I want to assist others to do the same as it is our given right to flourish and be ONE with the All That Is. This is our time to fully accept our heritage and our gifts that will assist Gaia and all of her inhabitants. So how do we do this? First of all we start to understand if we are working through our male or female energies. Those that are heart-centered usually are very emotional which is the female aspect and those that are very logical and mentally oriented, work through the male aspect. What we truly want to be is balanced in between, and allow both parties to have a union within. This workshop is in the process presently but I do foresee it occurring several times. It lasts for five weeks. If you would like to experience the first week which was an Introductory Class with a meditation and channeling, you will not be disappointed. The recording unfortunately is in two parts as we blew out the phone circuits during the channeling portion as the Divine Mother was giving us a message. Listed below is my Tele-Seminar page which houses the two links with a download for your personal use. In addition, I have put together a video presentation which is listed on my page giving some background information on the story of the Gods and Goddesses of this Earth and the enfolding that occurred for us to be in this state of awareness. Please let me know what you think of the recordings and/or video and I wish each of us a prosperous and amazing journey.